Ho ho ho it’s that time of the year again folks where online casinos start giving away all kinds of goodies on their Christmas themed slots. Casinowhizz decided to get a head start while the going is good. 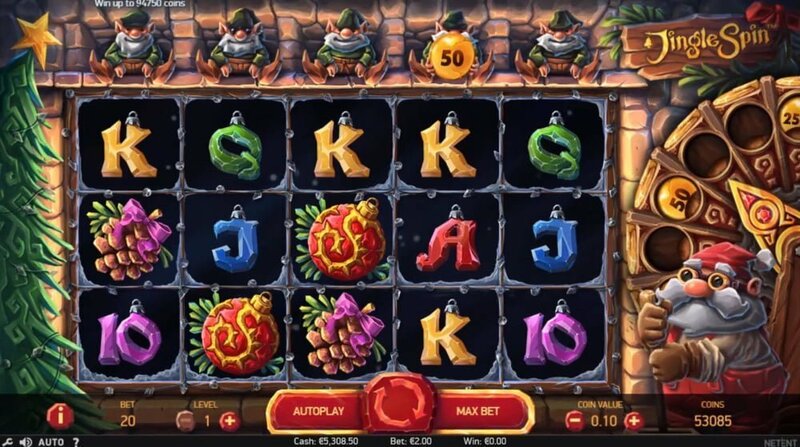 As we head on into the Feast of Season we’re going to cover our favorite Christmas themed slot machines and we’re also going to tell you why they tick all the boxes. Play N’ Go is fast becoming one of the premier developers for virtual casino games, as such it doesn’t surprise us as to why Merry Xmas video slot tops our list. The majority of the online slot games we’ve reviewed comes with a lot of hype not this one. How many bonus modes does Merry Xmas have? It has one bonus a ‘Click Me’ mode. Once the feature is played gifts appear on reels 1, 3 or 5 you must choose one of the three gifts, each gift rewards you with a payout of around 10x up to 30x your wager. The top cash prize that can be won here is 150x your stake. To be eligible for it you must bet the maximum £75 per spin. What other special features does the slots have? Playable on mobile phones (Androids, iPhones, tablets) and PC desktops from £0.15 up to a maximum of £75. There’s a Gamble Game too, after each winning spin you can double your wins by picking the right card’s color or suite. Stacked symbols during the main game keeps the bankroll ticking over nicely, especially when 4 wilds coupled with multiplier wins of 5x appear. In general wins during the main game are okay making it an enjoyable and entertaining slot machine. Fitted with 5 reels, 25 paylines high-staked players can chase a top cash prize of 513,000 coins which is really not too shabby. The RTP is 96% topped off with a neat amount of in-play bonus rounds that includes a Present Wild, Future Winnings and Past Winning Spins. We find that wins during the base game are relatively hard to come but delivers during the bonus modes. Bets start at $£0.50 per spin up to £$125 playable on mobile devices and PCs. Does the game have a free spins feature? Yes it does. There are two free spins bonus rounds: The Past Spins and Christmas Future Spins. Both of them are triggered when 3 or more scatters appear on the reels during the main game. 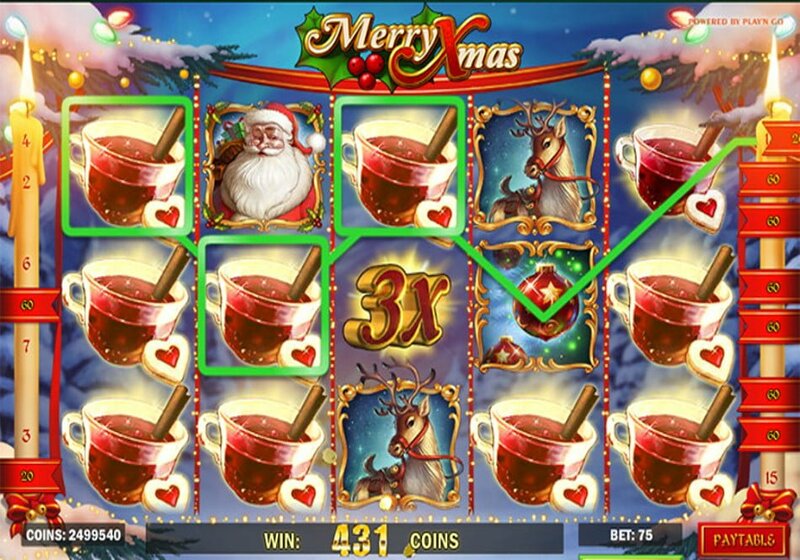 For instance, the Christmas Future Spins is initiated when 3 Christmas Future scatters pitch, 3 scatters gives you 3 free spins, 4 gives you 6 and 5 scatters awards 12 free spins. 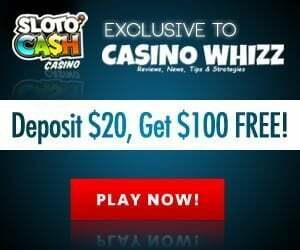 How many spins must I make before the free spins features are triggered? Depending on your average bet both free spins features can be triggered within 80 spins. How would we describe the game’s volatility? If we take the size of the jackpot (513,000 coins) into account we’d say it’s medium to high variance. Winnings spins don’t occur often but when they do they’re quite good. Expect average wins of around 5x to 40x your stake during the base game. In both free spins features you can win as much as 500x plus your stake on a single free spin. All in all the game has great winning potential. Santa’s slay is filled with a lot of goodies here! 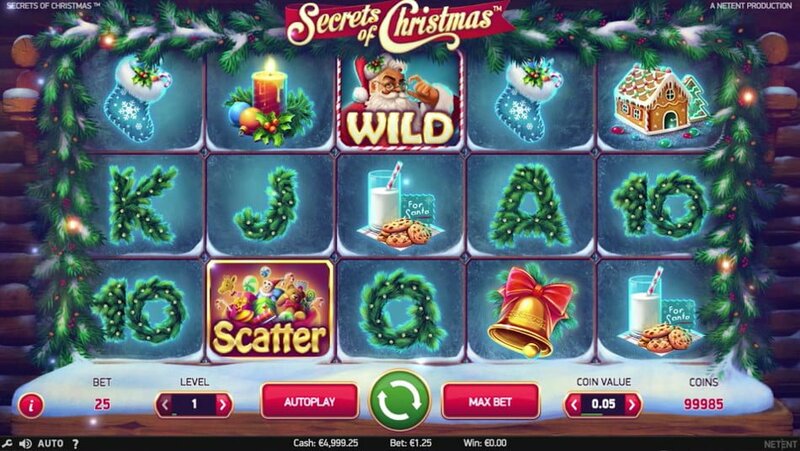 Secrets of Christmas a 3-row, 5 reel, 25 payline game allows you to hone in on a free spins round with a pick me feature, cracking jackpot of 350,000 coins and a RTP of nearly 97%. 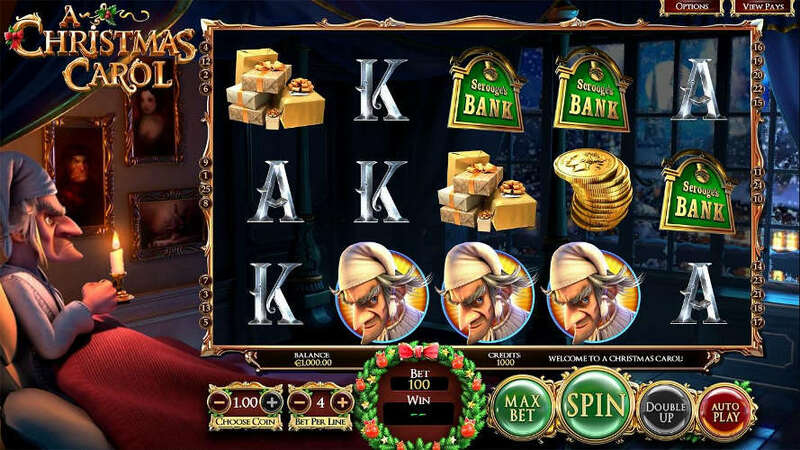 So much so that Secrets of Christmas a medium variance 3D slots is the pick of the crop in NetEnt’s game library. Of the bonus rounds which one is the most important? The main play occurs during the free spins. It’s played when 3 or more basket of toys (scatters) pop up any position on the reels during the main game – initially 10 free spins are awarded. It’s an interesting free spins because you’re given a choice between 5 picks where more free spins can be gained. Of the free spin picks the yellow truck, the 2 teddy bears and the snowman gives you a combination of an extra 2 free spins (12 free spins) with multipliers of 3x and wilds. Payouts during the free spins ranges from 30x to 600x your stake. The free spins can be triggered from 50 spins up to 175 spins, work on an average of 80 spins. To rope in the big wins you need a bankroll of at least £250. It only has one namely the ‘Jingle Spins Free Spins’ that’s initiated by 3 or more scatter icons. 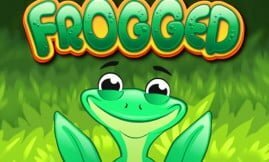 The free spins you can win are proportionate to the scatters, for example; 3 scatters gives 9 free spins, 4 awards 16 free spins and 5 scatters 20 free spins. 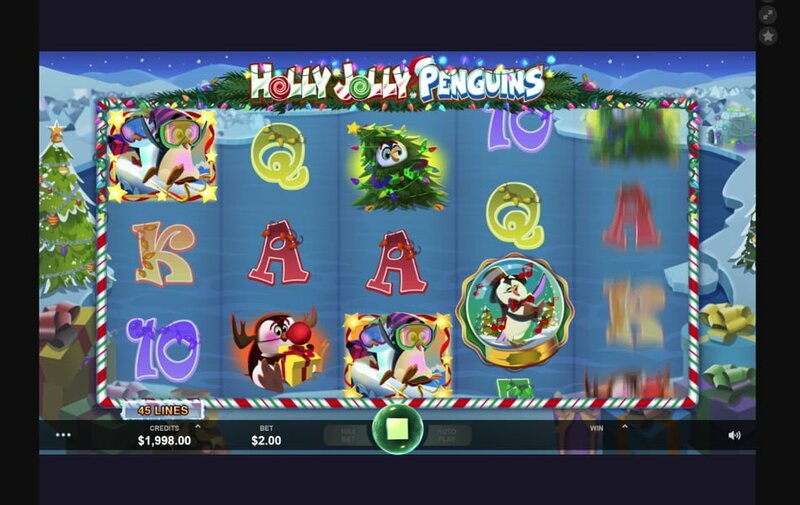 Furthermore, when the Santa wild pops up during the free spins it ramps up wins, and when an extra 2 or more scatters pitch more freebies are awarded making it a total of 40 free spins. Is it only for high rollers? It’s more geared for players (low rollers) looking for a bit of entertainment as opposed to big wins. By this we mean wins of 30x your stake, maybe more. The theme of the game is about a bunch of happy go-lucky penguins that grace the reel set. There is only one bonus round a re-triggerable free spins feature that awards as much as 80 free spins with stacked scatters! Triggering the free spins is quite easy, hopefully it is more than ample to get you into a festive mood. How many spins is needed to get into the free spins? At an average bet of £0.50 per spin we triggered the free spins (3 or more scatters) in under 40 spins. Scatter wins are given making it a lucrative free spins to players with different budgets. The biggest wins are reserved for the free spins, you can win as much as 550x your stake on each free spin.